Does anyone have any strong viewpoints on anything? Humanity, as we know it, is practically nothing. We are completely insignificant, and our lives really have no impact on anything. I'm sure people could argue that we help the human race progress, but i personally believe that the human race is incapable of making major advancements. We only are sure that humans exist on the Earth. 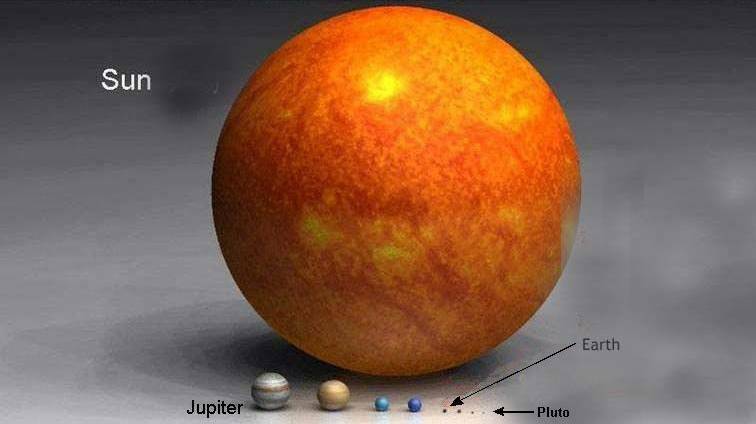 If we take into consideration the size of our Earth, being smaller than a pixel in this diagram, we should realize how minuscule we are compared to everything else. The sun is a relatively small star. If we imagine Humanity to be one tiny grain of sand, and we take into account how much larger the sun is than earth, we wouldn't be proportional to the Universe even if there were trillions of suns filled with sand. In conclusion, I believe that we are making great attempts to expand our field of knowledge (of the Universe), but it is impossible for a human to even comprehend even the size of a large star. How could we possibly be able to understand how dark matter rivets through the space-time continuum, how could we fathom the size of a galaxy? The only way that we will be able to make big advancements in our studies (pertaining to the Universe) is if every human could understand a bit of information, and then we all "stick our heads together." I think that it would be cool to program all of our knowledge into a supercomputer with artificial-intelligence, and then it would be able to make logical decisions for us. Thank-you Captain Obvious. I wouldn't call that philosophy so much as fact. Shortie : We do not quite understand dark matter yet. And your "Philosophy" is dangerously scientifical. And, what do you guys think? It depends, does the baby have teeth? Would it be able to enjoy the taste of the candy? Everyone, please follow the rules of this board. Claim: "the human race is incapable of making major advancements"
My Argument: "major" is a relative term meaning different levels of significance to different persons. Perhaps elaborate on what you exactly mean to be "major advancements". My counter-argument is that humanity began not knowing of fire. Now we have advanced to have even nuclear energy, which is quite a "major advancement" over fire I believe. Claim: "We are only sure that humans exist on the Earth." My Argument: Just because we are only sure that humans exist on earth doesn't mean that they cannot possibly exist somewhere else in the vast universe. After all in the past humans were "certain" that the world was flat, and were also "certain" that the Earth was the center of the universe and all things orbited around it. Claim: "we should realize how minuscule we are compared to everything else"
My Argument: Size doesn't always matter the most. A single drop of strong poison can kill a man faster than a massive inflatable bat. Also, just because we are relatively small, as a species, now doesn't mean that we will not grow; after all, the total population of the Earth continues to rise. Claim: "it is impossible for a human to even comprehend even the size of a large star"
My Argument: Comprehension is different to different people, of course. Some people cannot even comprehend why certain plants die in the winter. Yet others are able to mentally balance complex chemical equations, analyze complex economic game theories, or even win a chess match at the master level without ever looking at the board. Obviously some people ARE able to comprehend the sheer size of a "large star" as Vidar's informative GIF shows. Final Note: As for the "big advancements" in our studies of the Universe, etc. having EVERY person understanding information pertaining to the research is quite nearly impossible and yet completely unnecessary. Bringing the entire planet together to collaborate is not necessary, bringing together the best minds in the field is another thing to consider. Throwing aside international barriers and pulling the elite minds together would perhaps bring some even more impressive advancements than what we already have had. Programming it all into a supercomputer can have good or bad effects... it could quite possibly make everything easier to have open information sharing amongst all nations, and yet it could also bring apocalypse via machines. Though the latter is an extreme that doesn't seem likely, there is still an offhand chance that it could happen . I still think you're talking more about science than philosophy. Besides, the thoughts in Bule's opening post were titled On Life and Humanity. I think it is unnecessary to bring in the whole universe when you want to discuss humanity, because as you pointed out it makes us seem rather insignificant and in a way makes the whole discussion useless. You have been talking about big advancements in our studies about the Universe, now let me ask you a slightly more philosophical question: in the end, what do we need those studies and advancements for? Bule asked in the first post if anyone has a strong viewpoint on anything, and my strong viewpoint is that the whole modern human race has become too scientific. As we see in this very thread, we are supposedly talking about philosophy, but all we can do is state facts which have scientific evidence to back them up. That, in my opinion, is not what philosophy is about. Humanity and Earth aren't worth a crap if you look at the big picture. But what do we do about it? Thinking "I'm nothing" without a pile of self preservation would probably result in a mass suicide. 'Luckily' humanity hasn't dreamed of to space, we're still here and the emptiness is still out there. Zoom in a bit and you'll notice how important humanity is to the race itself. People don't care what's out there and what isn't. They care about their own and their close ones lives (well, at least the majority does). It is certainly not impossible for a human being to comprehend the sheer size of the world. I don't know what 4.2421 lighyears tells to you, but I'm at the very least seeing it as one hell of a distance. Out of reach - yes, out of comprehension - no. Your supercomputer reminds me of a certain Merlin, or later Melchizedek. Having a supercomputer to make all the decisions would result in the perfect world, wouldn't it? It could indeed result in a 'perfect' world in case evolution could be stopped. A machine will theoretically evolve infinitely when they become smart enough to make smarter versions of itself. Not to mention that it would occur incredibly much faster than our biological evolution, if you are to thrust Darwin. And what if your supercomputer is built? Wouldn't the most logical question not to care, on a universal scale, or extermination on an Earthly scale? It's extremely likely that there is life on other planets somewhere, but that doesn't mean that they will be/are humans. We are nothing compared to the space continuum but then again we are localised to our world. We are nothing even compared to our whole world. Probably we are nothing compared to our local continent as well. And we can be nothing compared to... All right, some of us are ranked number one on some German CSS server but I hope you get the idea. We don't need whole Universe (though we need whole world because of the balance, transfer, relations etc. etc. ), the point is we do matter in our local environment. No system would work without test subjects. Universe would be empty without matter (no antimatter then as well). Space is filled with vacuum. Is that absurd and a paradox!? Why comparing us to something bigger than us and unknown to us? We should all realize we are nothing in the Universe so there is no point for us to exist? Existentialism? Resignation? Should I quit my job of being a human being because I'm nothing compared to a star or black hole or whole Universe? No no, it doesn't matter for me to exist. At least this is how majority thinks and they (or probably we) are right. Why breaking our head over something we won't find a solution to and missing our local job because of that? Super computer... All good. But there are certain limitations with super computer. First of all there is a limit in poduction. We would be able to create a gigantic computer with enormous capabilities but it would cost us a fortune and it would be totally inpractical. There is another thing... AI is impossible for now. Computer works after human logics. Programmer writes a code, it "translates" it into a program which does something for you then. We are already capable of producing programs which would make decisions based on logics for us. That's how most of the programs work. We aren't capable to predict things in Space Continuum or Universe or which ever you like more so we cannot create AI which would give us perfect answers. You can create a perfect answer for the past but finding one for the future would be only predicting and guessing. If we could bend time, then it would be possible. But we can bend time!!! But again this is something to be discussed and polemics involving it will go on for a long time. Human beings live for a bunch of random emotions and feelings, that should be what daily basis consists of and this is what everybody should be left with. You take that away, you get a machine? That's why Universe and Quantum physics for me is a subject to discuss only when I have nothing better to do. I'm too small to bend spoons or travel through a wormhole. In future or some paralel dimension/world perhaps I am grown up enough to do that. I'm interested in such things, I read things, I even learned about certain stuff in school but I would leave this subject for when I would want to sound smart. Does anyone else have a topic that they would like to discuss? In the topic about life "out there", I always think of the question: even if there is life somewhere else, and more specifically an intelligent one, what is the chance that it will be evolving in the same time frame as ours? If I remember correctly, there is the theory our universe has been in existence for 15 bln years (true or false, doesnt matter, its the proximity that counts). The sheer amount of time considered means that there is very little probability that intelligent races can evolve at a similar time in 2 or more places of the universe. For me that is reason enough to not take my time and think what might be "out there". While thinking we're alone in the universe is a tad arrogant, it is a bit blunt (though not necessarily wrong) to say that it's extreme likely that there are other life on other planets. For one thing, the earth is in what seems to be an extremely unlikely situation in regards to how the planet behaves. Many factors play in, among them: distance to the sun, the water and the moon, the slowed down and self-regulating nuclear fusion, the magnetic field and Jupiter. Remove any of them, and we're hard pressed to sustain life for an extended amount of time. While the situation may be different for other planets, they're gonna need some pretty bizzare situations to sustain life in a manner compared to the earth. And while I think there's life in outer space apart from on earth and ISS, I think the image is a bit more complicated than it jujst being extremely likely.